As January marched through the door many people started spending more time ‘appraising’ themselves in the mirror and thinking ‘Hm, does my bum look bigger? Ouch, my abs are sticking out and there is no sign of a six-pack definition. My thighs look more prominent in the jeans, maybe I should wear a skirt?’ Sounds familiar? On top of that everyone talks about detox but all you crave is warmth, peace and quite after the frenetic pace of the festive season, as you gaze with envy at the tanned celebrities luxuriating themselves on the beaches of the sunny lands. At that exact moment an e-mail from Waterhouse Young Clinic landed in my work inbox, inviting me to have a consultation about the new treatment that they now offer, a fat freezing technique called Cooltech. Waterhouse Young Clinic was founded in April 2012 by two of the UK’s respected cosmetic surgeons, Norman Waterhouse and Richard Young, who have 36 years worth of experience on Harley Street. As there are plenty of women ( and men ) who don’t necessarily want to take the surgical route to improving their faces or bodies, Waterhouse Young set up a clinic in Devonshire street, around the corner from their very successful Harley street practise, which offers leading non-surgical treatments. According to the press release that I received, all treatments are clinically proven and research-based, in order to ensure results and client satisfaction ( in addition, staff who works at the clinic also have an opportunity to try those treatments prior to them being offered to clients, hence they can share not just researched & trialled aspects, but their own experiences before you make your choice ). From face treatments like Botox ( administered only by a doctor in the WY clinic ) and a facial targeting pigmentation, wrinkles and sun damage to now a new body treatment Cooltech, you will have quite a choice at your fingertips. A year or so ago I started hearing about a fat freezing treatment called Zeltec and I am going to raise my hand honestly here and say that I was intrigued. At the time the idea didn’t cross my mind to try it, but I did make a note for my mental Rolodex. Now an e-mail was sitting in my inbox and making me curious. Cue another admission -I was also nervous of the unknown. What if my inner organs would be frozen? What if it wasn’t tested enough, as the clinic only started offering it to clients since January and not much as yet is known of possible side-effects ? Am I becoming vain? Should I be going to the gym more often instead? Now, what is ‘Cooltech‘ treatment ? It is a fat-freezing procedure which promises to reduce fat in ‘treated’ areas by at least 20% after just one treatment ( mind you, that statistic can vary, as all of us are different ). This treatment is not recommended to obese people and you should consider it only if you are relatively fit and healthy but have stubborn areas of fat that just won’t shift with diet and exercise. It can be done on abs, thighs, arms or love handles, as well as knees but not your bottom. According to Waterhouse Young Clinic staff this ‘treatment is clinically tested and CE approved and is an effective non-surgical and natural way to lose stubborn lumps and bumps’. The procedure is supposed to be effective for both men and women and, unlike other fat-removal systems, it can treat up to two areas in one treatment session and up to four in a single day, thereby achieving optimum results in less time, as well as offering ‘smooth’ results unlike that sometimes offered by the liposuction. 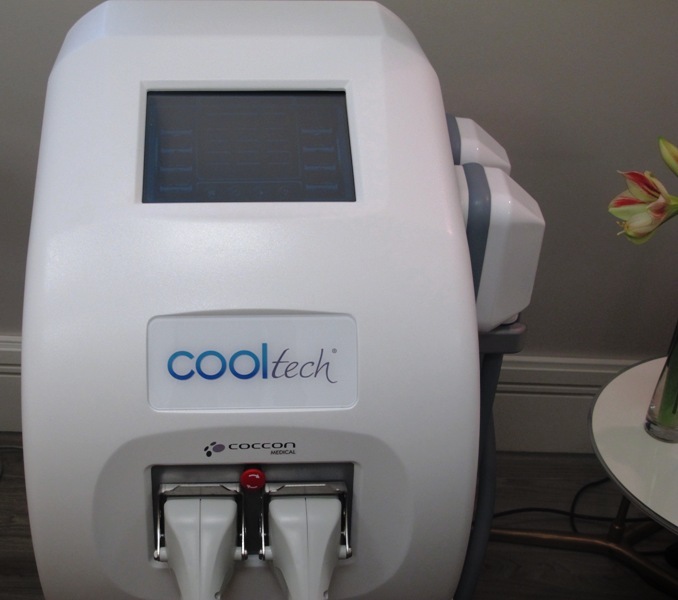 Cooltech uses Cryotechnology (Cryolipolisis) to freeze fat cells, while protecting your skin and other tissues. When a fat cell is frozen, it dies and then, together with its contents, is expelled by the body’s normal metabolic processes. The clinic itself ( beautifully decorated but understated in its ambiance ) is located on the top floor of the building and you are met by a smiling receptionist and then led to the waiting area. You fill in a standard medical questionnaire ( and later sign a consent form as well ), in order to make sure you are suitable to have the treatment and there aren’t any contra-indications, like pregnancy, high-blood pressure etc. This is also your chance to ask as many questions as you deem necessary. Mine were addressed to the clinic’s charmingly calm director Anna Silsby. She assured me that the procedure was safe, but did stress that results differ from person to person and that one shouldn’t expect miracles. I nodded, fully appreciating that she wasn’t promising me golden mountains. As they say, no pain, no gain. Anna offered me some healthy snacks and a delicious antioxidant drink before my treatment and somehow by the time Anna led me to the treatment room I felt surprisingly relaxed. As I already mentioned, my area of annoyance is my abs ( thank you babies ). Anna and Rosie, my therapist, took photos, measured my waistline and then did a ‘fat pinch test’ that you sometimes get done at the doctor’s surgery during a medical or at the gym. This is the time to ‘let it hang out’, as they say, as the result would be put into the machine in order to do your treatment on the chosen zone. With all this out-of-the-way, I pulled my sweater up, un-zipped my jeans and lay down on a glamorous version of a dentist’s chair that was covered in a cosy, warming blanket. Anna and Rosie first put on a cool, gauze-like cloth ( anti-freeze membrane ) on my stomach, making sure that my skin was fully covered and thus protected from frost-bite. The actual Cooltech machine has two applicators that look like domed bricks or a miniature version of camel humps. Each attachment is hollow inside and this is where you fat will be sucked in and frozen to -8C, enough to freeze fat cells effectively for fat reduction, and safe enough not to cause unwanted tissue damage. By treating each area for 70 minutes, Cooltech can produce natural-looking results in as little as just one session ( you will have to be patient with the transformation though, as results are not expected to be seen for at least four to six weeks and then can continue to improve for up to three months ). To be honest from the research that I did prior to this treatment, somehow I expected it to be more uncomfortable to start with and yet Cooltech is a surprisingly relaxed treatment and more importantly for those of us not keen on ‘vanity surgery’, it is non-invasive in the sense that it doesn’t require needles or incisions, therefore no anesthesia or pain medication is needed and there is no ‘down- time’. I came in ‘armed’ with a stack of magazines to keep my mind busy and nerves at bay, but Rosie told me that I could have a head, arm or leg massage ( or all of them, one after another ) and I guess psychologically it is hard to say ‘no’ to something that has a potential to relax you when you are feeling nervous. Within 15 minutes I was almost ready to doze off ( yes, the areas that were ‘sucked’ into the applicator by that time feel cool and numb but somehow as time went by, I ended up feeling cosily cocooned in the blanket and with Rosie’s skillful hands, expertly massaging my sculp and then gently pulling on my hair, thus stimulating hair follicles, my mind and body relaxed fully ). As I was in danger of falling asleep, I decided to chat to Rosie – all in the name of research! After Rosie finished my head massage, she moved around to give me a wonderful hand massage with a fragrant Miller Harris lotion. When she told me that 70 minutes were almost up, I was truly surprised. Now, a slightly scary visual for you. As the machine is switched off and the pressure is released, you look down and see two red, camel-like humps ( or aliens .) protruding either side of your belly button and they feel like icicles to the touch. Then the nurse starts to massage ( each one in turn ) it gently and within a minute the so-called ‘hump’ flattens and you stomach looks like it did before the treatment – the only difference is that you skin in the treated area looks an angry red colour, as if you overdid sunbathing on the beach, without the burning sensation. By that time I had a sudden urge to dash to the bathroom-that is to say that I was feeling well, focussed and not in any pain. To aid the lymphatic drainage and to achieve results more quickly, Waterhouse Young exclusively offers their clients Cooltech combined with the Pressotherapy treatment. Pressotherapy takes place immediately after Cooltech in order to increase circulation and promote lymphatic drainage, thereby helping achieve better overall results – a gradual pressure is felt from the feet upwards, as massage is used to increase the circulation. This relaxing treatment ( it takes about 30 minutes ) aims to improve the function of your lymphatic system post fat-freezing, thus increasing lymphatic circulation and speeding up elimination of metabolic waste. Imagine climbing into the space-suit trousers, that go up to your chest and being zipped up in them on the chair. The machine gets set up and what follows is the ‘zoned’ sensation of the blood pressure cuff inflating and deflating. Starting from your toes upwards, each zone of the suit gets inflated and then released, as it progresses upwards. You feel slight pressure but it is nothing but relaxing. I must admit, as my nurse left with my permission for a few minutes, my mind started racing, picturing a mechanical malfunction and me getting inflated like a balloon, to bursting point – feel free to laugh at my expense and say that I have an active imagination ! This wave-like, pressure sensation continues for 30 minutes, after which you get dressed and are ready to leave. I was told to drink plenty of water and to try to avoid eating red meat ( so far, not too successful ), eggs and shellfish for two weeks ( you don’t have to, it is just a recommendation ). You might continue to experience numbness in the treated area for a few weeks and some shooting pains but you can call the clinic if you have any concern. As the rain pummelled Marylebone, I dashed out to get a juice and then went back to work, before going to a pre-theatre ( Rapture, Blister, Burn at the Hampstead Theatre ) discussion hosted by Bazaar magazine on the subject ‘Can Women Have it All ?’ The answer from Justine Picardie, the editor of Bazaar UK ? ‘Not on the day of the tube strike!’ I felt somewhat reflective on the subject, thinking that in one day you can do a school run, freeze your fat, work and have a stimulating conversation before seeing a great play, the afterthoughts from which linger for a while. The next day I woke up with a tiny bit of bruising on one side of my abs and the feeling of slight numbness in the treated area, but apart from that I can’t report any side-effects of discomforts thus far, almost a week later. The only moment when I truly can feel the ‘treated’ area is when I skip down the stairs or exercise and then my abs feel like I have overdone my usual workout. I also feel a little bloated, that is unusual for me. At the same time I urge myself daily to drink more water and herbal teas, take my supplements religiously ( which ones I will tell you in the follow-up of this diary ), do dry skin brushing, followed by application of Weleda arnica oil to my abdominals in the morning and use a gentle scrub on them in the evening ( every few days ) and try to make healthier choices when it comes to my diet. My exercise regime has been somewhat sparse this week ( about 20 minutes of yoga in the evening every other day ), due to my work schedule, but I plan to take it up a notch or two in the coming week – an hour and a half Krav Maga session done successfully today, with no aches or pains. Disclosure: my combined Cooltech & Pressotherapy session was done for free, with prior agreement with the clinic that I will write an honest diary detailing my treatment and experience. Combined Cooltech & Pressotherapy treatments cost £950 per session, £2550 for a course of 3 at Waterhouse Young Clinic, located at 21 Devonshire street, London, W1G 6PB. Well, Galina, by the looks of things, your abs are in quite good shape already. That said, Brave Lady that you are! You have placed yourself upon the altar in the name of honest reporting. Did you notice any desired results after one session? How many total do they recommend? (Did I miss that part?) You can do 4 of those in one day?! Could you have imagined doing that after one time? I do like the body massage…that is a draw. You wouldn’t believe what I tried once! Honestly, it was ridiculous and I felt like a wrapped mummy on an exercise glider (and looked like one too). I was wrapped tightly in bandages from neck to feet, then sprayed with a detoxifying spray (already feeling totally skeptical of that one! ), and then squeezed into a plastic wrap to trap the heat and catch the “toxins” that melt off you as you glide on an exercise machine to create the heat…Strange – absolutely! The esthetician measured my body mass before and after. It felt like it took AGES to finish, as she had to respray me at 20 minute intervals for a total set of three. At the end, I didn’t really see much of a difference, though the measurements showed a slight reduction. She said that smokers, coffee/alcohol drinkers, or drug users often eliminate a murky brown water at the bottom of the plastic. Since I don’t indulge in any of these, my water looked like the same color as the one she sprayed! Rather disappointing but not surprising. Galina, I think we would have fun swapping stories like this! Thanks for your faithful reporting. It was a very entertaining read. You aren’t expected to see any results for about 6 weeks and are told that from the beginning-no instant miracles .) In theory I don’t see why you can’t have a treatment on another area straight away. The clinic recomends a course of three treatments, at least six weeks apart but you are told that as everyone is different, one might be happy with the result after just one session. I’ve been looking to have the non-invasive fat freezing treatment, from what i can tell the best results are to be seen on stubborn fat such as love handles and that it is best if you have a healthy life style, am i wrong in thinking this? Will it work on all fatty areas? If someone can help me in answering my questions?